Amour is the order of the day with this design! 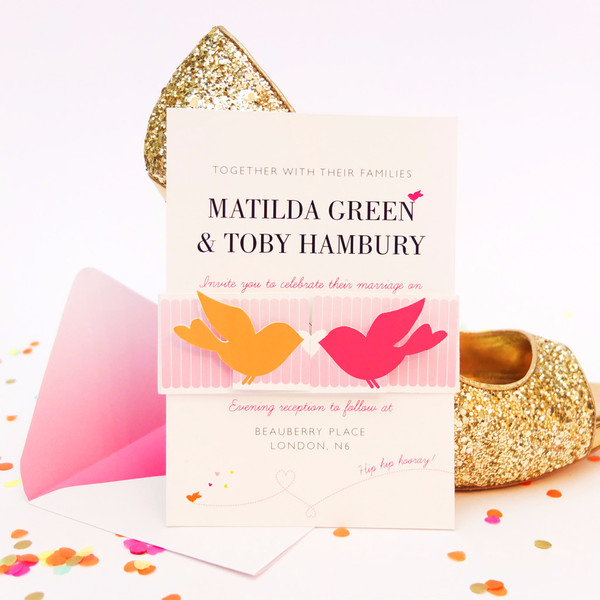 If you’re looking to celebrate your love and you’re not afraid of a little bit of smoochy-smooch, the Cute as Candy wedding invitation by Eagle Eyed Bride could be right up your street! Taking centre stage on a striped pink and white belly band is a seriously loved-up pair of birds. Love is obviously in the air as they reach over to embrace with a tender kiss (or peck on the beak!). Behind this, you and your guests will find your wedding day details, printed in a stunning modern font. The Bride and Groom’s names stand out perfectly in a bold, black typeface which is beautifully complimented by a line of text printed in a more classic font in hot pink. A cheeky little bird perches atop the last letter of the Bride’s name, providing a sense of fun and personality. If you opt for RSVP cards you’ll be pleased to know that they’re designed as postcards, making it super quick and easy for your guests to fill in and post back to you straight away. Whether you choose the 2 or 3 paged invitation, you’ll receive stylish matching pink graduated envelopes to finish the look off perfectly. Chic, practical and produced to a high standard, this design is one that will stand out from the crowd. We’re sure you’ll look back on this design in years to come and fall in love with it all over again! Tags: Candy Stripe, Love Birds, Mustard, Shocking Pink.